Zio Aluz 1 and 2, a new concept in the Premium series uses anodized duralumin. What's great about Anodized Duralumin? Anodized Duralumin is aluminium alloy made stronger and more durable through a process called 'anodizing' which involves placing a sheet of aluminium into a chemical acid bath. The oxidized aluminium forms a strong coating as it replaces the original aluminium on the surface. The result is a substance called Anodized aluminium that is light weight and scratch proof. Won't it be too stiff? Aluz 1 & 2 temple uses thermoplastic material that is durable, flexible and lightweight. the choice of material for the temple is to complement the front to provide the wearer with a comfort fit. The implanted nose pad arm in stainless steel is both adjustable and has the right degree of elasticity to maintain it's adjusted position. The silicon pad will provide wearer a better fit. 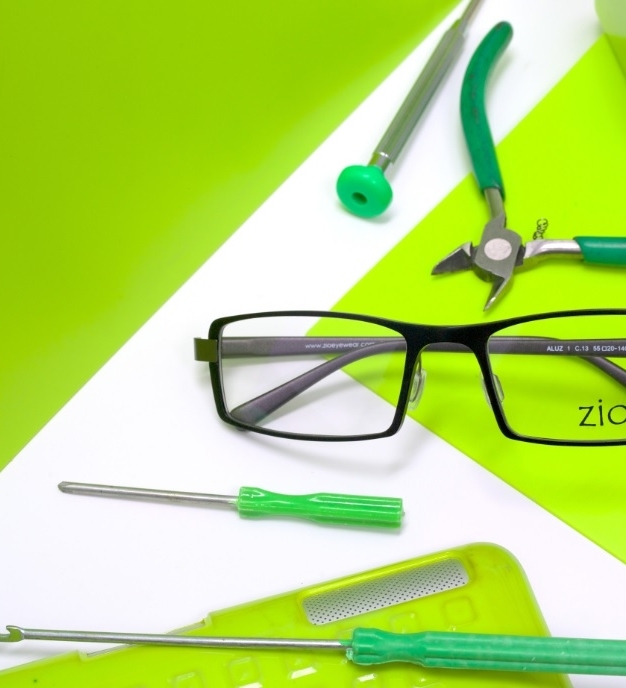 The end result is a pair of "up to date" designer optical frame that carefully uses optimum materials for each part of the glasses.